SAFETY FIRST: Antifreeze is highly toxic and can kill pets and animals if drank. Do not leave coolant where animals (including children) can get to it. All modern liquid cooling systems use a pump to circulate the coolant through the system. These water pumps should be inspected regularly as their seals can and do fail. Most water pumps have a built-in seal inspection feature called a tell-tale hole. The tell-tale hole is located directly below the water pump. The water pump’s mechanical seal has failed if coolant leaks from the hole. 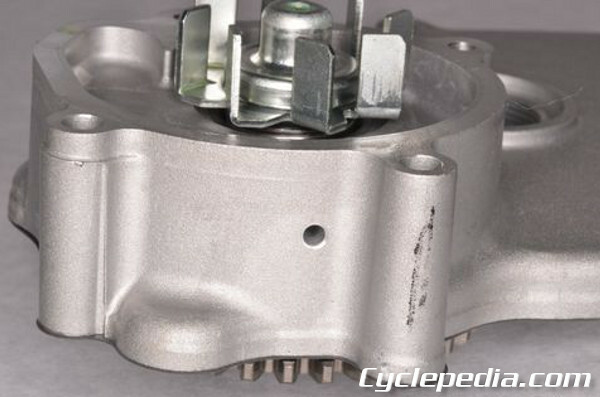 The water pump impeller must be turned by the engine. The mechanical seal allows the engine to turn the water pump impeller while keeping the coolant and engine oil separate. A typical mechanical seal is shown above. The spring loaded rubber seal pushes against a plastic seal ring on the water pump impeller to form a water tight seal while allowing the shaft and impeller to rotate. 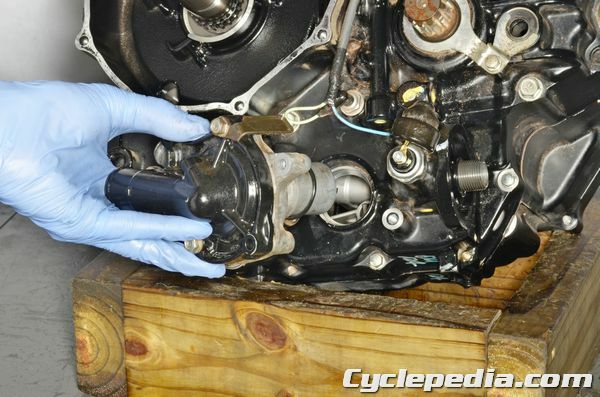 In most cases there is also a separate oil seal further down the water pump shaft to seal the engine oil. If coolant leaks past the mechanical seal it will flow from the tell-tale hole. Remove the impeller and/or shaft to access the mechanical seal. Note, many impellers have reverse threads. Remove the mechanical by driving it out from the opposite side or carefully prying it out. 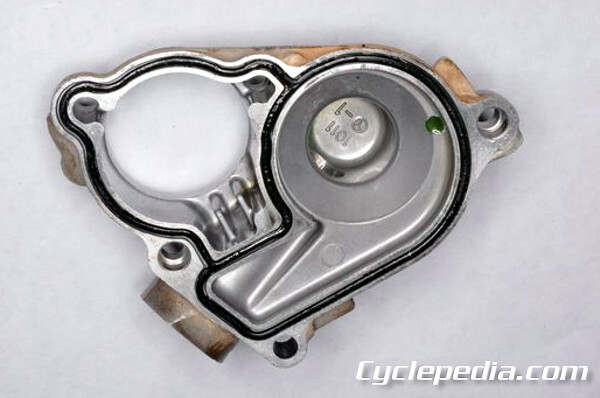 Avoid damaging the seal or water pump cover mating surface by prying against them. 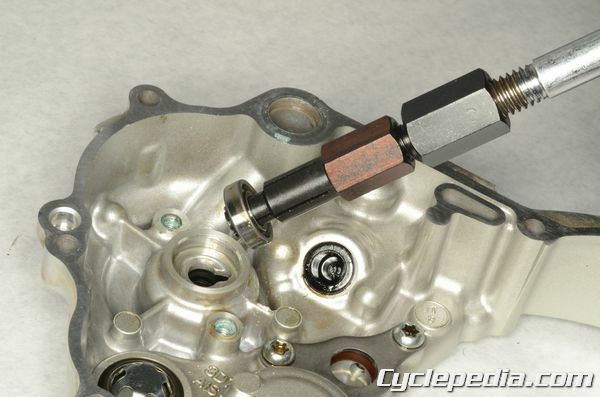 On the example above, the mechanical seal allowed coolant to leak past it causing the impeller shaft to rust. The corrosion built up in the space between the mechanical and oil seals. The oil seal was not far from failing as the impeller shaft had become rough and pitted where it was making contact with the oil seal. In this case, the mechanical seal, oil seal, impeller shaft and bearings must be replaced. 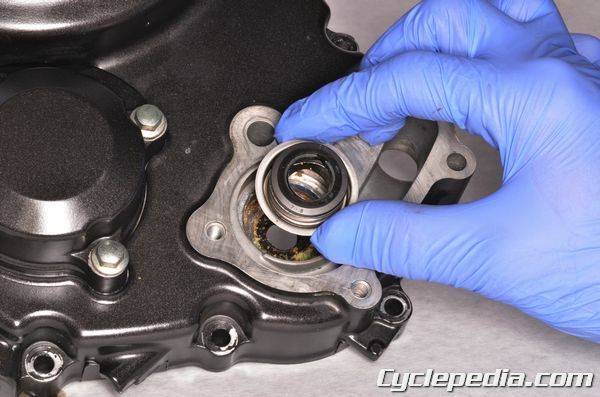 When disassembling a water pump for inspection, check the condition of the seals, bearings, impeller, and shaft. Take the time and replace all of the suspect parts while they can be easily accessed. It is generally recommended to replace the seals as a set. 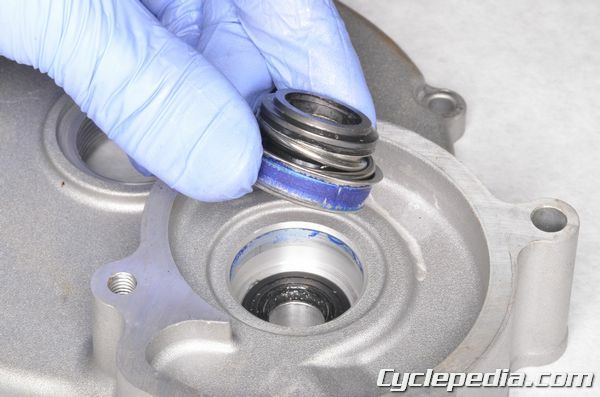 Often the water pump shaft bearings must be removed to access the seals. 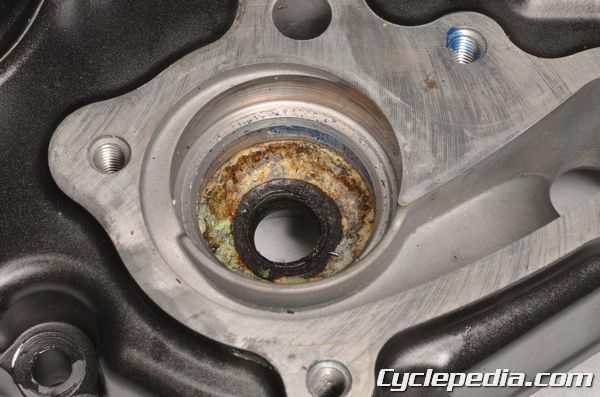 Most manufactures recommend replacing the bearings with new items if they are removed. There are a few other type of water pump seals. Some models use a one-piece seal that acts as both a mechanical seal and oil seal. Others use two rubber oil seal type seals, one to seal the oil in and one to seal the coolant out. Also, most water pumps have an impeller cover O-ring or gasket that can leak. 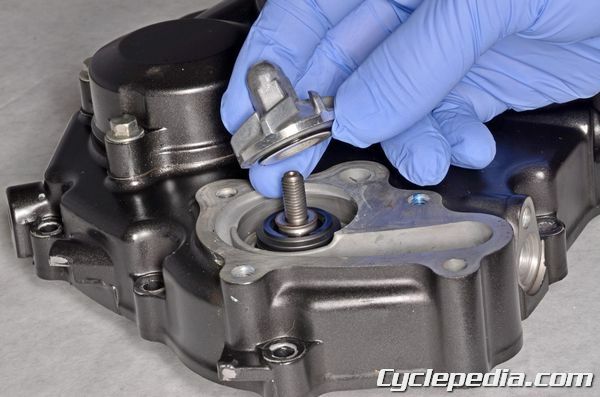 Replace the O-ring or gasket seal anytime the cover is removed. Drive in the new seals with a suitable driver that is the same outside diameter as the seal. Some mechanical seals may require a press or special mechanical seal installer tool. For a good seal against the case, mechanical seals may require the application of sealant between the metal mating surface of the seal and the case, others may come with a special coating from the factory. Always follow the instructions in the service manuals when replacing these seals. Some water pumps are not serviceable. These must be replaced as a unit if an internal seal fails. Always use a new o-ring when replacing this type of water pump.